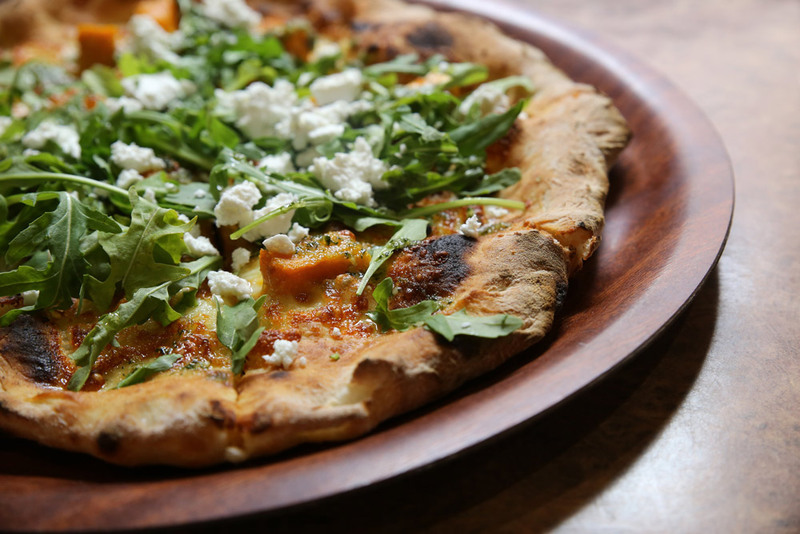 The sweetness of onion and pumpkin combined with the saltiness of feta and olives make this colourful pizza a flavour sensation. Combine sifted flour, yeast, salt and sugar in a medium bowl. Make a well in the centre and pour in warm water and auzure Canola Oil. Stir to combine, then turn onto a lightly floured board. Knead for about 8 minutes, or until smooth and elastic – adding more flour, if necessary. Grease a medium bowl with a little auzure Canola Oil. Place dough in bowl and cover with plastic wrap. Leave in a warm place for about one hour, or until double in size. Meanwhile, preheat oven to 220ºC. Place pumpkin, capsicum and auzure Canola Oil in a large baking dish and stir to coat. Bake 30 minutes or until tender. Remove and set aside. While the vegetables are roasting, cook the caramelised onions. Heat auzure Canola Oil in a large non-stick frying pan over a medium heat. Add onions and reduce heat slightly. Cook, stirring occasionally, for 15 minutes or until very soft. Add sugar and cook for a further 3 minutes, stirring continuously. Set aside. Increase oven temperature to 240ºC. Lightly oil 2 x 30cm diameter pizza trays using auzure Canola Oil. When dough is ready, punch it in the centre, then turn onto lightly floured board. Knead lightly, just until smooth. Divide the dough in half. Roll one half to a 24cm circle, place on a prepared tray and use fingers to push the edges of the dough to fit the tray. Repeat with remaining dough. Spread pizzas with pizza sauce, leaving a 3cm border. Top with caramelised onions, then pumpkin, capsicum, feta and olives. Sprinkle with dried herbs. Bake 10 minutes, then switch tray positions. Continue baking for 10 minutes or until base is browned. Top with rocket and serve immediately.